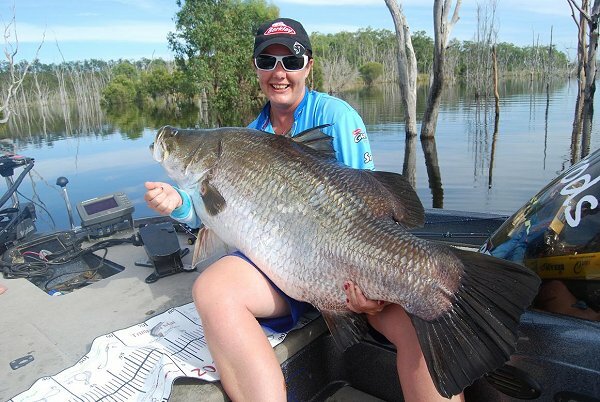 Barramundi are a premier game and sport fish. Fishing methods include trolling, lure casting out soft plastics, hard body baits like crank baits, Fly Fishing and surface lures. Barramundi are a premier game and sport fish , and they are prolific all across the Northern Territory and Kimberley coast. Their full range extends from Shark Bay in Western Australia across the top and down to the Mary and Maroochy river systems in Queensland. Dawn and dusk is the preferred time and the summer months (November to March) during calm humid conditions the best. Deep diving lures cast around structure, weed beds, drowned timber etc. is the way, although trolling can also produce the goods. Current Barramundi All Tackle Record (IGFA) 98 lbs. 6 ounces. Fishing methods include trolling, lure casting out soft plastics, hard body baits like crank baits, and surface lures. Barramundi fishing can be undertaken by casting lures to “structure” such as submerged logs, rock bars and overhanging banks. Barramundi are basically lazy fish and mostly will not put in too much effort to catch a feed so casting needs to be tight. Barramundi can also be caught by fly fishing and by trolling and they can be tough on gear so make sure you have the best. A favourite haunt for barramundi is amongst mangroves and around submerged logs and other overhangs where it waits to ambush it’s pray. 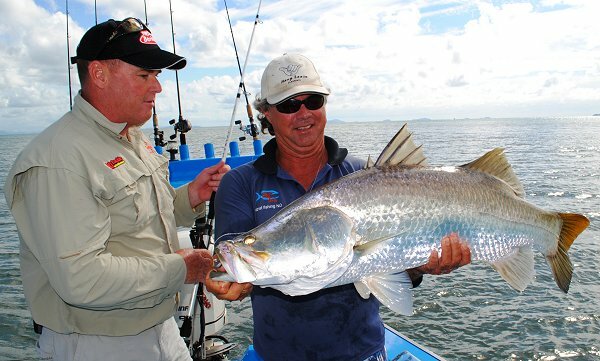 Barramundi prefer larger waters with a slow continuous flow and water temperatures above 20 C.
The Barra will hit the lure or fly hard and run for the snags and the fisherman is usually the loser if the fish gets there. Lures to suite. There are literally hundreds of Barramundi fishing lures on the market and everyone swears by a different type. Gold, brown, blue and red seem to be popular choices in colour and what ever you get should swim at least two meters deep if not deeper. Visit a local tackle shop before you set out and ask them what works best locally. Appropriate reel with at least 200m of 15-20kg backing. Braid is best. Flyline- intermediate and/or floating weight forward. < font>Gulf of Carpentaria and adjoining waterways south of the intersection of longitude 142 09' east with the shore at high watermark.